CHICAGO (AP) The Chicago Cubs will have to get by without closer Brandon Morrow for a little while. The Cubs placed the right-hander on the 10-day disabled list Wednesday because of lower back tightness, leaving a short-handed bullpen without its most important piece. While Morrow went on the DL, Yu Darvish threw a simulated game. Manager Joe Maddon said he looked ”outstanding,” and the Cubs will see how he feels Thursday before announcing the next step as he works his way back from tendinitis in his right triceps. 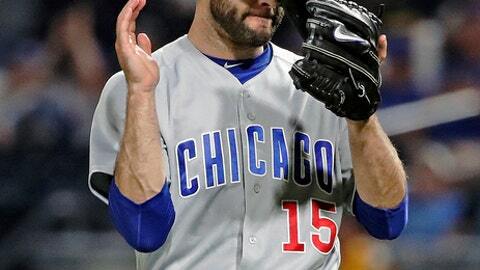 Morrow – signed by Chicago to a $21 million, two-year contract in December after helping the Los Angeles Dodgers beat the Cubs in the NLCS – has 16 saves in 17 chances. He hurt his back taking his pants off at home early Monday morning, after the team returned from St. Louis. The Cubs put him on the DL before their game against the Dodgers and announced right-hander Justin Hancock will remain with the club after being called up from Triple-A Iowa as the 26th man for Tuesday’s day-night doubleheader. Morrow said he’s ”pretty comfortable” walking, but feels it when he sits. He said he would have needed a few more days to be ready to pitch. But the Cubs opted not to hold his spot on the active roster. The Cubs are also missing relievers Carl Edwards Jr. (right shoulder inflammation) and Brian Duensing, who is on the bereavement list after his grandfather died Saturday. Maddon said the matchups will dictate who closes with Morrow sidelined. He also said the Cubs are ”very close” to mapping out a plan for the return of Edwards, who has been throwing. He said the Cubs hope to get Duensing back by Friday. Darvish, meanwhile, said through an interpreter that the simulated game went better than expected. He felt some anxiety before the outing but felt comfortable on the mound and had good command of his fastball and slider, though he needs to work on his curve and splitter. Darvish also said he thinks he will need only one rehab start before rejoining the rotation. Once he is ready, the Cubs will have some decisions to make. Mike Montgomery has a 1.21 ERA in five starts since he was inserted into the rotation in Darvish’s absence. And Tyler Chatwood leads the majors with 63 walks. Darvish is 1-3 with a 4.95 ERA in eight starts, not what the Cubs envisioned when they signed the prized right-hander to a $126 million, six-year contract in February.